[XPB-WCXBUFB-X] [DISCONTINUED] Our U-Leg Cedar Flat Wooden Bench has unique signature radius edges that not only give a more modern style, but also take away the sharp square edges. 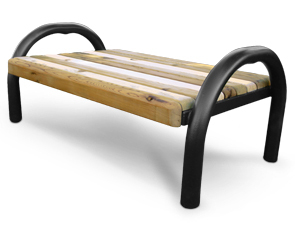 This modern wood bench is made with your choice of the highest quality Cedar. Factory sealed to decrease the damaging effects of UV rays, protect wood against dry rot, and reduce warping. Clean design with no exposed hardware. Made with heavy-duty contoured steel frame for added strength and all weather durability. The 2-7/8" O.D. frame is polyethylene coated with three color choices to select from. For shipping quotes, orders or questions please call our Customer Service Center at 1-877-483-9270. Bench Selections: 6 Ft. (+$145.00)4 Ft.